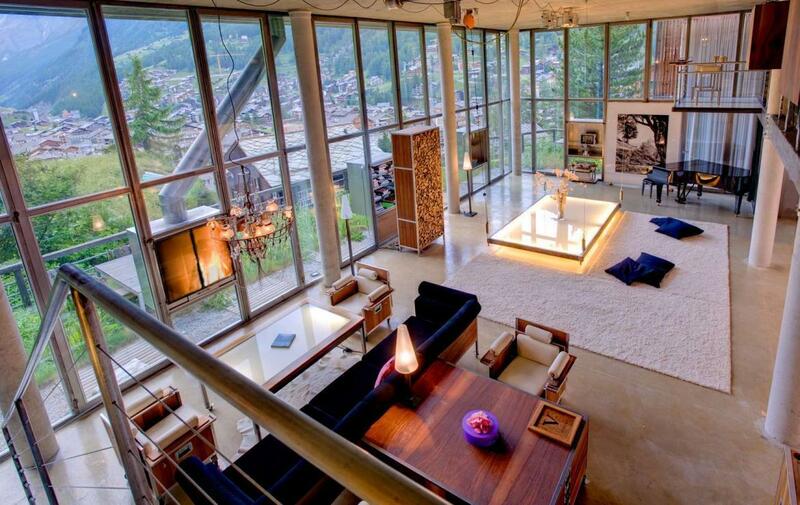 This is without doubt one of the most spectacular properties in Zermatt. 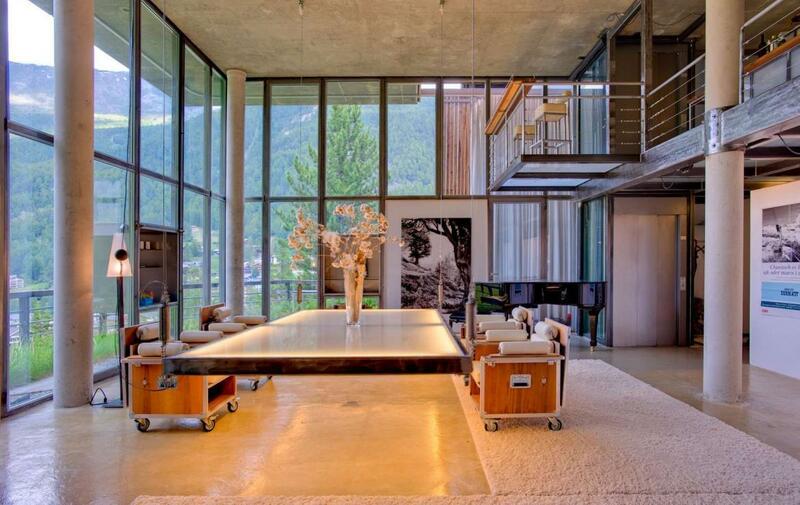 A huge 300m2 Manhattan style loft set in a wooden chalet in the Swiss Alps; it combines acres of glass, steel, textured concrete and wood in a unique symphony of fusion architecture created by local star designer Heinz Julen. 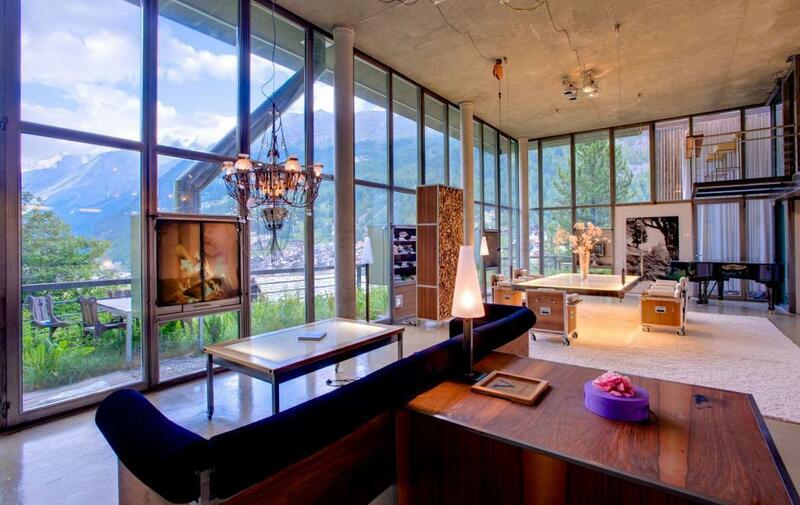 This is Heinz Julien private home where he hosted many rock-star parties and has now become available for rent during the winter season. Access to the property is a 2 minute walk from the top of the Omnia Hotel lifts, for which you will have a special key. 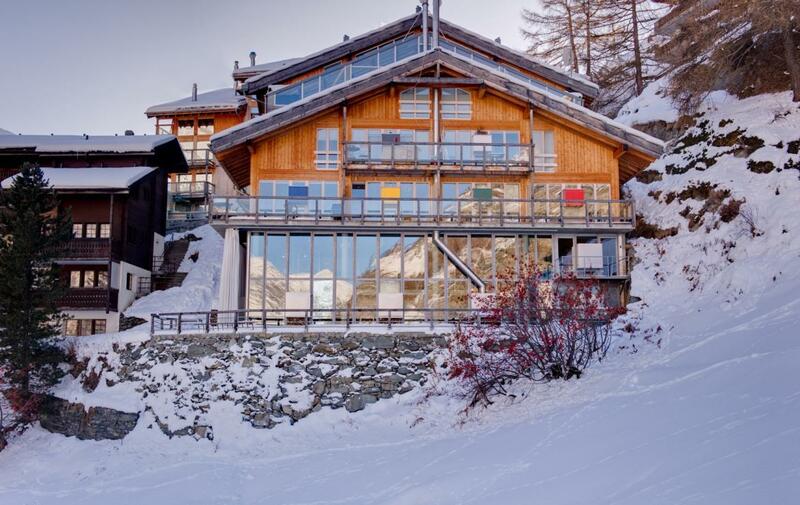 The village end of the lift delivers you to the heart of Zermatt, in the main street close to the church. The sense of space, light and closeness to nature that the loft provides is unparalleled: there are no barriers between the nature outside and the home space inside – all is fluid and free. On the two sides overlooking the village, the walls consist of floor to ceiling glass, with French windows 6 meters high leading to a large terrace. 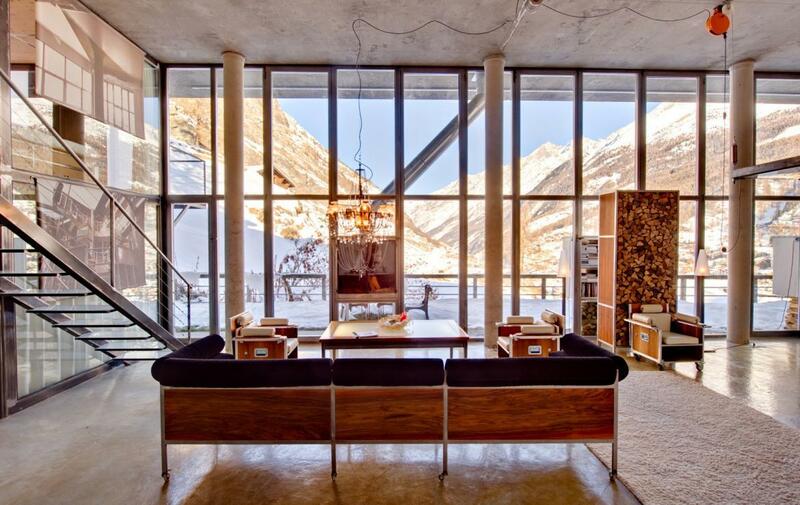 (There is a white electric exterior curtain that can wrap itself around all that glass if need be). 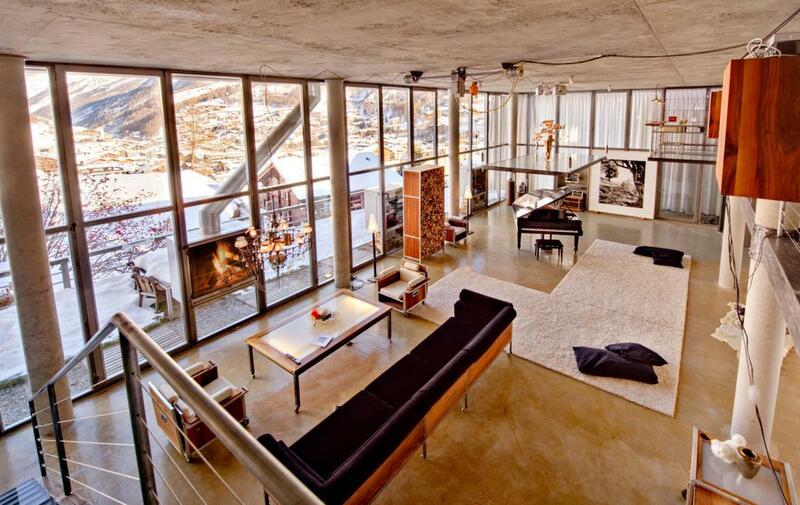 The ceiling is supported by seven columns, while the glass walls have an inset fireplace and three alcoves. 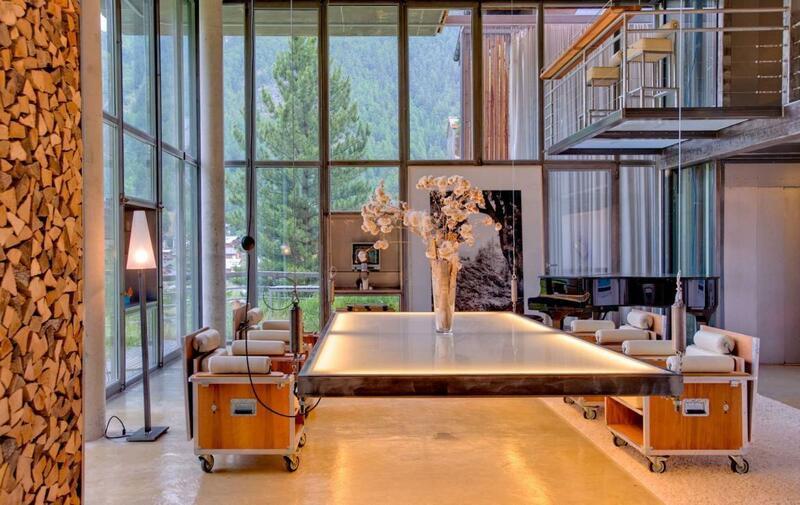 The main loft living area has a suspended and illuminated table which can be raised and lowered from coffee table, to dining table, to ceiling height; the latter creating a large party space. 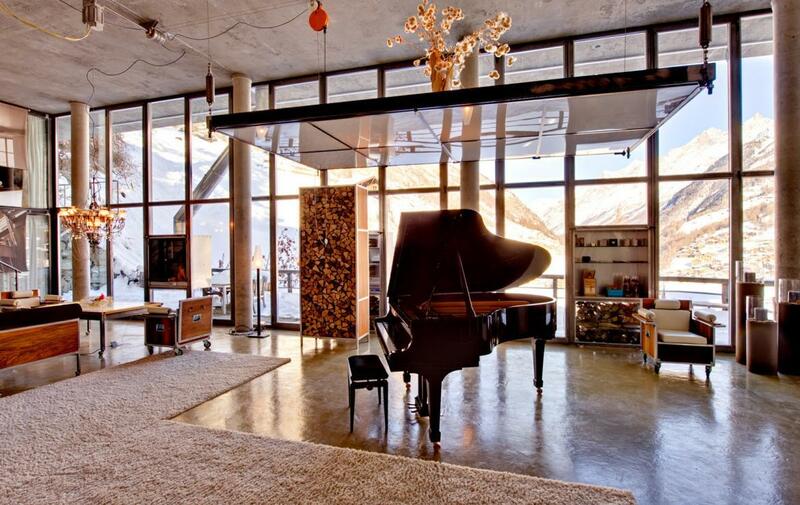 In one corner you can play on a baby grand Steinway piano, while in another you can sink into a large sofa and gaze simultaneously at the stunning view over the village and at the crackling fireplace set into the glass wall. 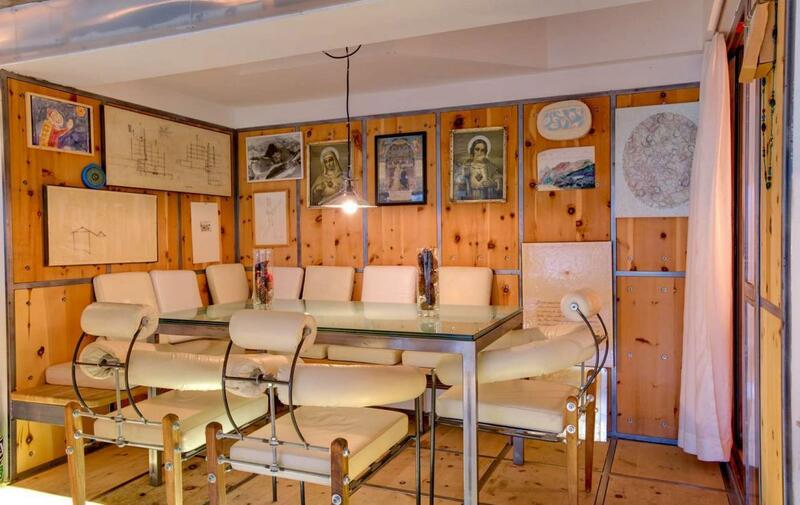 Around you: two desks, jack-in-the-box armchairs, a wall of art, and a signature Heinz Julen chandelier. 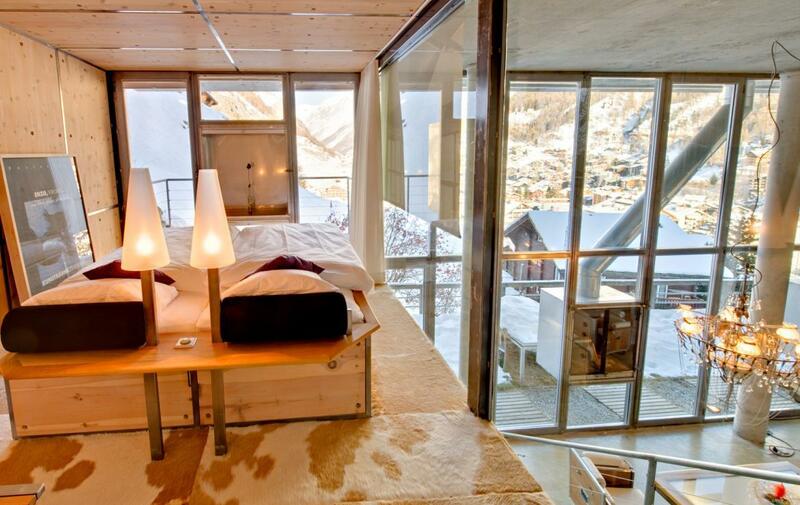 In fact, all the sought-after furniture in the Loft is designed by Heinz Julen. 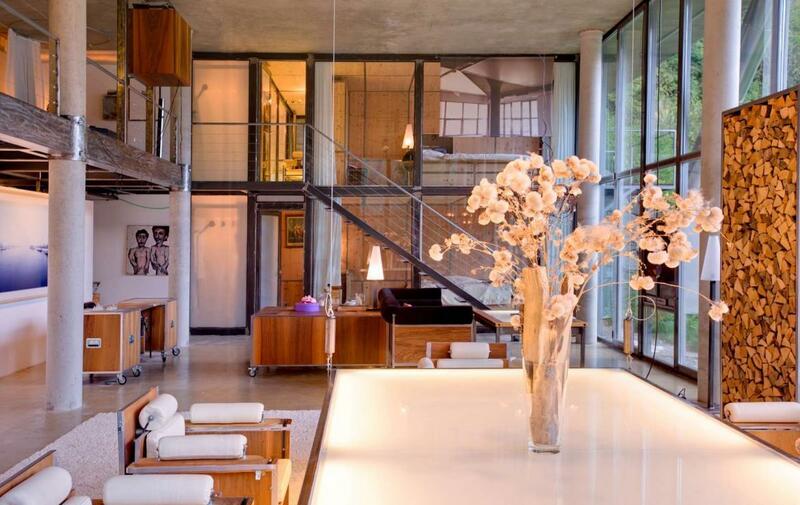 From this level a metal staircase leads up to the mezzanine, which has another sofa chill-out area with TV; a free standing Jacuzzi bath, a cozy dining alcove, a galley kitchen, a cantilevered bar area and a guest toilet. As you walk on this floor you will notice that the floating feeling it creates is due to it being made entirely of opaque glass with subtle inset lighting. 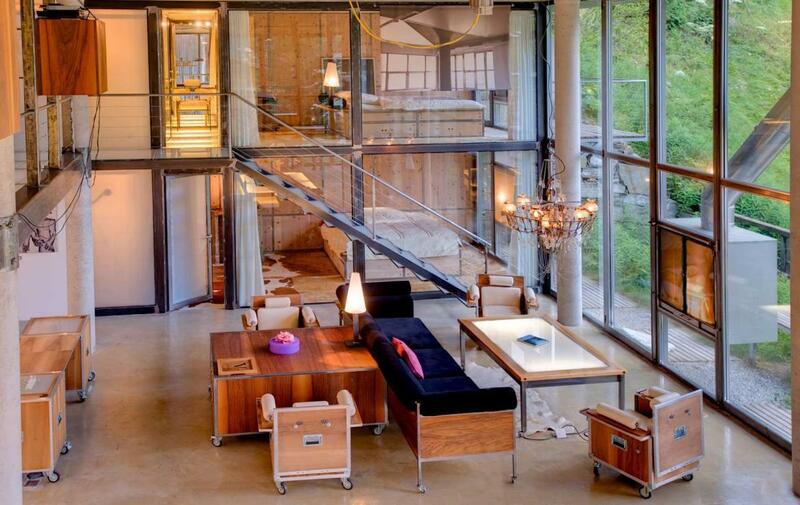 Overlooking the main loft area, there are two double en-suite bedrooms, one above the other. Each bedroom has its own small bathroom with shower and WC, and a balcony. 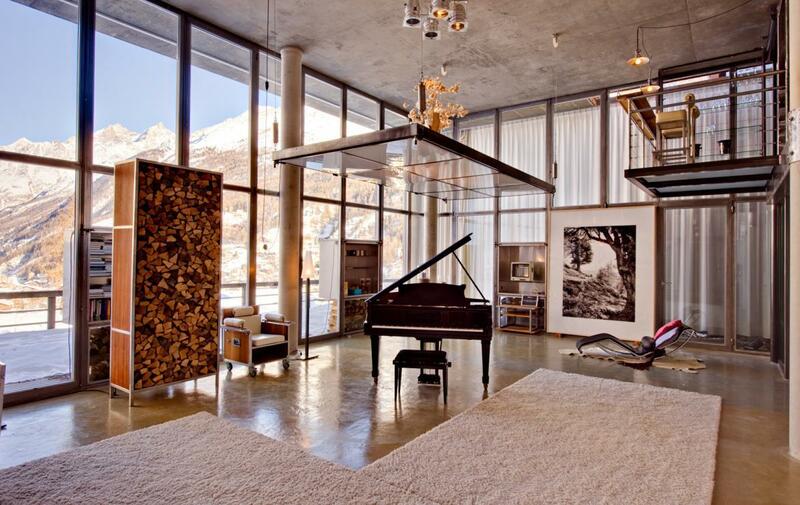 The third, master bedroom is very private with its own landing. It is an exact replica of the famous Into the Hotel suites created by Heinz Julen, featuring a free-standing bath with wood-slatted massage cover, an island bed on a rotating floor, his and her bedroom sinks, a separate shower room and WC, a walk-in wardrobe, a sofa, and a TV set into the glass window. 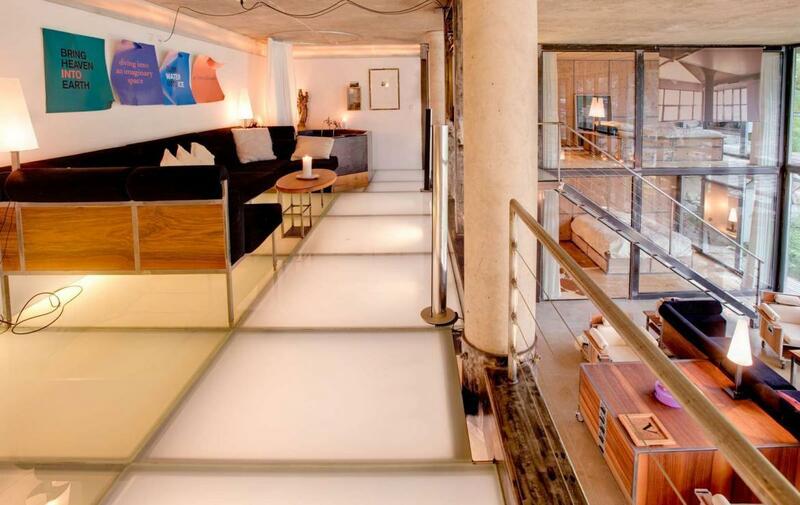 Both levels of the Loft are served by a private lift.